We hear a lot these days about unapologetic blackness. And in the seven days since we lost Muhammad Ali, we’ve had a chance to remember and honor one of our own who perfectly embodied the concept. Arguably, at least for those of us born in the second half of the 20th century, he’s the one who taught us all what it means. Not only was Ali’s fighting style unique, not only was it unprecedented, unrivaled in his time and impervious to true duplication ever since, but Ali’s signature style of dancing in the ring was art. And Ali was the artist, specializing in the genre of performative blackness, expressed through the medium of movement. If it seems a stretch to claim that Ali’s status as The Greatest of All Time, or the GOAT, was somehow achieved because he was able to beat the living daylights out of opponents with his performative (and danceable!) blackness, I get it. Ali was a boxer. He trained and studied and adjusted his eating and sleep habits so that he could beat the living daylights out of his opponents with his fists. But it’s not a stretch. Read essays on Ali in the ring and you won’t be able to avoid the dance metaphor, which turns out to be barely metaphoric. Jim Murray of the Los Angeles Times called him “an artist,” who, “didn’t have fights … [but] gave recitals.” Ali himself appeared on a television talk show and not only described his own footwork as dance, but performed that dance for the audience. Consider the string of words writer Eric Raskin used to describe his movements: “circling, shuffling, hopping, dipping, ducking, feinting, jitterbugging.” Toes tapping, yet? These words sound indicative not only of dance, but of a particularly African-descended lineage of dance. These words conjure a rapidly reversing reel of images: black kids in Baltimore making mumping videos, black; kids in the Bronx, New York, break dancing; black people rushing the field during entertainer Rufus Thomas’ set at the Wattstax concert in 1972 to do the chicken dance; and, well, these fine folks cutting a rug. We can go back to buck-dancing, to the beginnings of tap. And we can reach through the diaspora and go all the way back to Africa and traditional African dance. And here we have a natural pit stop, both geographically and theoretically. Thinking about sport, art, dance and fighting brought to my mind a little Black Atlantic cultural hub that was, for some millions of Africans, the first and last stop on the Middle Passage: Brazil. In Brazil, we encounter capoeira, a form that hybridized sport, dance and — not at all incidentally in a conversation about Ali — black political identity and black political philosophy centuries ago. Historian Matthias Röhrig Assunção’s book, Capoeira: The History of an Afro-Brazilian Martial Art, describes capoeira as “the black art of the male underdog” and “a model of counter-hegemonic practice.” It doesn’t feel premature to assert that capoeira and Ali have a lot in common. 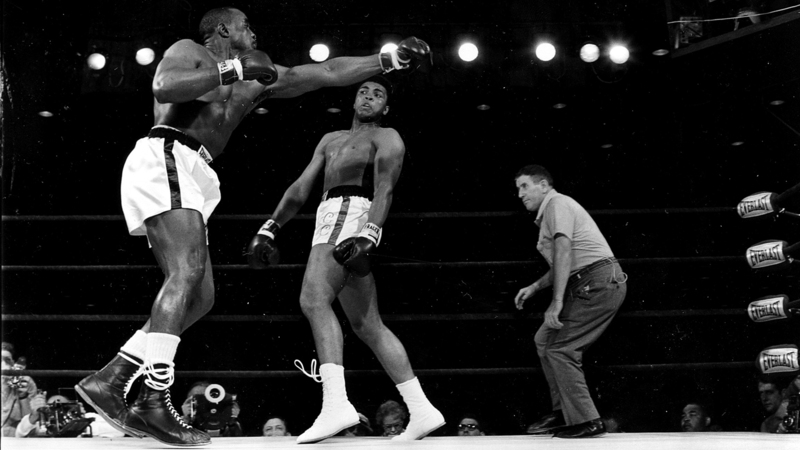 Challenger Cassius Clay, right, gets out of the way of a long left jab thrown by heavyweight champion Sonny Liston during title fight in Miami Beach, Fla., on Feb. 25, 1964. Clay, 22-year-old from Louisville, won the title crown with a TKO in the 7th round. In the editor’s foreword to Assunção’s book, it states the following: “Capoeira does not shy away from consequent awkward complexities; it confronts tired clichés … it is impressively authoritative … capoeira was a form of confrontation of the politically strong by the politically weak.” Ali much? Even without the think-speak, a quick study of the movements of capoeira and the hopelessly addictive video and GIF of Ali dodging 21 punches in 10 seconds finds the similarities striking. Capoeiristas are deceptive, adaptive, rhythmic and expressive in their efforts to control the space they share with their opponent. Opare further explained how dance terms such as “energy attack” and “flow” can be used to analyze Ali’s movements in the ring, differentiating between the “very free and light” early style characterized by sharp attacks and the post-exile fighter he became, with the heavy flow rope-a-dope style punctuated but not dominated by sharp attacks. Ali, the fighter becomes Ali the artist, employing various phases and elements to create a new story with each new opponent rather than, as would a dancer, adapt and respond to each new audience. What we have to remember here — because we are talking about Ali, capoeira, the African diaspora, blackness and the search for Africanness — is that the story being told is not merely a competitive tale of two men who meet as equals in a roped square armed only with their fists. The story being told is about identity and conflict. And, as Opare asserts, the “ubiquitous blackness” of Ali necessitates both a dancer’s sense of space and a black man’s sense of how that space is politicized, whether he is in the ring or not. Ali had both in spades. Athleticism, as borne by dancers and athletes alike, is a big part of the reason we know there is something magical about being human — that even though within each of us are the same assortment of 37.2 trillion cells, with skeletons made of the same 206 bones, animated by the same approximate 650 muscles — some of us are exceptional. Ali was exceptional. Ali is exceptional. He used his body to teach black and white America what it means to look race in the face. We didn’t all always like what we saw, but how could we? For some black Americans, when we want to reach for something that doesn’t make us quite so ill, we reach for Africa. There is a rhythm in West African dance called dununba, or “the dance of the strong men.” It is an example of dance as social ritual, through which the diversities of manhood are celebrated. As its English translation suggests, the dance allows for men to articulate their maleness through displays of strength, courage and bravery, or to resolve conflict, bolster community relationships or perform important historical moments in an effort to preserve community values and memory. What is painful for black Americans about the seemingly inextricable link between who we are as black people and the violence and trauma we’ve experienced because we are black people can be soothed, for some of us, by seeking and discovering a connection to what came before our history as enslaved people. Ali was no different, but because he was exceptional, he positioned himself to help us get there sooner. Ali is the capoeira of boxing. He is the dununba of the ring; the dance of the strong man in the flesh. He wasn’t perfect, and it’s true he embodied violence in often brutal ways, but he was not shy about his complexities, or ours. And he did not fall at the feet of his own contradictions. He showed us, time and again, how to get back up. He showed us how to float. And we will forever be grateful.